There is a widespread perception that the foundations of American democracy are dysfunctional, public trust in core institutions is eroding, and little is likely to emerge from traditional politics that will shift those conditions. Youth are often seen as emblematic of this crisis — frequently represented as uninterested in political life, ill-informed about current-affairs, and unwilling to register and vote. By Any Media Necessary offers a profoundly different picture of contemporary American youth. Young men and women are tapping into the potential of new forms of communication such as social media platforms, spreadable videos and memes, remixing the language of popular culture, and seeking to bring about political change — by any media necessary. In a series of case studies covering a diverse range of organizations, networks, and movements involving young people in the political process — from the Harry Potter Alliance which fights for human rights in the name of the popular fantasy franchise to immigration rights advocates using superheroes to dramatize their struggles — By Any Media Necessary examines the civic imagination at work. Before the world can change, people need the ability to imagine what alternatives might look like and identify paths by which change can be achieved. 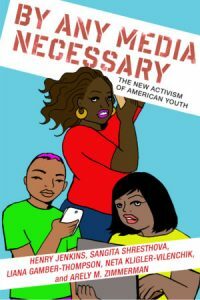 Exploring new forms of political activities and identities emerging from the practice of participatory culture, By Any Media Necessary reveals how these shifts in communication have unleashed a new political dynamism in American youth. This book is part of the Connected Youth and Digital Futures series that explores young people’s day-to-day lives and futures. The volumes consider changes at the intersection of civil and political reform, transformations in employment and education, and the growing presence of digital technologies in all aspects of social, cultural and political life. The John D. and Catherine T. MacArthur Foundation’s Digital Media and Learning (DML) Initiative has supported two research networks that have helped launch this series: the Youth and Participatory Politics Research Network and the Connected Learning Research Network. The DML Initiative and the DML Research Hub at the University of California, Irvine, support production and open access for this series, published by New York University Press.